The first two small scale Basara Club Fan Meeting 2015 Spring events took place in Tokyo today and according to a handful of reports from the people lucky enough to attend, there was a live dialogue reading from a newly-revealed Setouchi (Motochika and Motonari) route of some kind which will feature in Sengoku Basara 4 Sumeragi. It was apparently comical but there was no specific mention about whether it was a Motonari or Motochika route. It might have been the anime route which was hinted at in the game's first promotional video. Even more excitingly, a new Sumeragi promotional video debuted at the event which revealed that series veteran Ishikawa Chiaki will be performing the game's ending theme! Motonari's seiyuu reportedly commented that the video was packed with ridiculous moments. Another event taking place at the moment is the Sengoku Warrior Chronicle Fair Chapter 1 "The Mystery of Sanada Yukimura" fair in Osaka. Japanese fan @yukimurabo attended today and reported that the new promotional video was on display at the Sengoku Basara 4 Sumeragi booth too (there's a photo at the Twitter link). I'm guessing that the new video and ending theme song confirmation will appear online on Monday unless they decide to keep the news event-exclusive until the final Fan Meeting event on 18th April. Update 05/04/2015: A couple of additional shots from the video have now been posted too. Now I think about it, the 18th April is when the preorders open so they might hold the video back until then. I hope not! Speaking of Yukimura-themed events in Osaka, it's also been confirmed that Capcom (and Koei-Tecmo) will be attending the Tennouji Sanada Yukimura Fair "Akazonae No Shou" again on 10th May 2015. 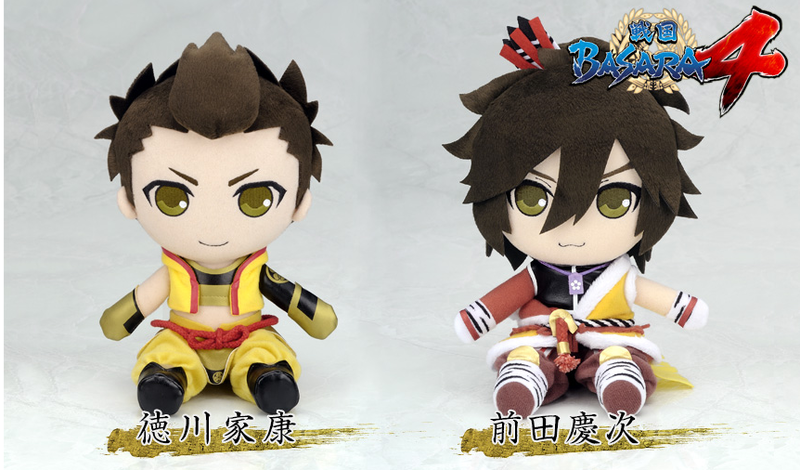 The two new plushies (Ieyasu and Keiji) which were revealed a little while ago have now been spotted on the official Algernon Product website. While they'll go on general release in June 2015, visitors to the Super Comic City 24 doujin event can pick them up at the Gift booth on the first weekend in May. I compiled all of the confirmed information about Sengoku Basara 4 Sumeragi into a single post yesterday to make it easier to keep track of things. Though I'll keep blogging new information whenever it's announced as usual, if you're not sure about anything that post is the best place to check first since I'll try to keep it up to date. A fellow fan recently emailed me asking for skill and weapon translations for the Utage characters who weren't playable in Sengoku Basara 4. I'll add the skill names for all of the new characters to that master post when I have time (and when they're all revealed) but since Ujimasa isn't in the game this time, here are his details from Sengoku Basara 3 Utage. do u know if the game will cam be pre ordered on amazon or any websites that are in the pound, thxs on advance :) and thxs for the posts. Thanks! The game will definitely be available on some sites which allow you to check out in Pounds but wait until 18th April as that's when the 'official' preorders begin. I'll add all of the Amazon links to this post so you can check there for the full list and choose the best website for you.